In 2000 the Council on Foreign Relations established the Maurice R. Greenberg Center for Geoeconomic Studies to examine issues at the intersection of global politics and economics. Few issues fit that description more closely than the subject of this Council Special Report. America’s current account deficit is financed by foreign purchases of such assets as Treasury securities and stakes in U.S. firms. A good deal of these purchases today are made by the central banks and sovereign wealth funds of countries that do not share many American political values and foreign policy goals. Some argue that this is no cause for concern. But Brad W. Setser makes a compelling case that the U.S. deficit matters for economic and strategic reasons alike. The United States may have more to lose than its creditors if they sell American assets or stop accumulating them at their current pace. This gives creditors potential leverage over U.S. policy. Setser also argues that indebtedness limits America’s ability to influence other countries’ policies, for example through sanctions and lending arrangements. The problems associated with U.S. indebtedness cannot be addressed overnight. But the report proposes ways for the United States to guard against the effects of a disruption in foreign financing, such as consulting with allies who hold dollars and encouraging other creditor countries to spend and invest surpluses instead of accumulating reserves. It also suggests measures to reduce the need for financing in the first place, such as working to balance the U.S. budget and, most importantly, taking steps to reduce U.S. oil imports. 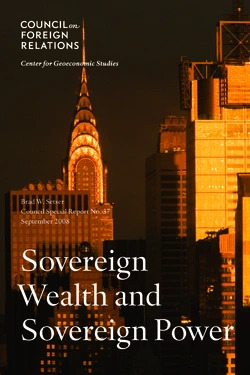 Sovereign Wealth and Sovereign Power raises the potential strategic implications of U.S. indebtedness, challenging the sanguine view that global economic interdependence guarantees prudence. The report is a significant contribution to the debate on America’s political and economic position in an age of globalization.